May 2, 2013 - Boeing rolled out the F-15SA, ushering in a new era in fighter aircraft capability and affordability for the Kingdom of Saudi Arabia. The F-15SA, the newest variant of the combat-proven F-15, provides improved performance and increased survivability at a lower life-cycle cost. The aircraft has two additional wing stations for increased payload and capability. "We look forward to receiving the advanced capabilities of the F-15SA aircraft to continue to protect the security and stability of the Kingdom of Saudi Arabia," said Lt. Gen. Mohammed Bin Abdullah Al-Ayeesh, commander, Royal Saudi Air Force. "Our relationship with the U.S. Air Force and The Boeing Company has helped to ensure the Royal Saudi Air Force remains among the best-equipped air forces in the world." 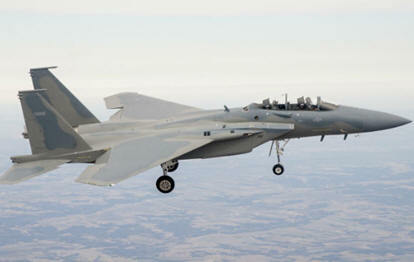 Flight testing began this year on the F-15SA. The Royal Saudi Air Force has operated F-15S fighters since the 1990s. The Royal Saudi Air Force (RSAF) has ordered 193 F110-GE-129E engines to power 84 new twin-engine Boeing F-15SA aircraft. With the order the RSAF becomes the largest operator of F110 engines other than the U.S. government. This follows earlier RSAF orders for 156 engines to power 71 re-engined F-15S aircraft. "The Kingdom and Boeing have been partners for 65 years and our partnership goes beyond the innovative products and services we provide," said Dennis Muilenburg, Boeing Defense, Space & Security president and CEO. "Equally as important are the excellent collaborations between Boeing and Saudi educational and industrial organizations." "The F-15SA will enhance the national security objectives of both the United States and the Kingdom with improved interoperability and common training and support well into the 21st century," said Lt. Gen. C.D. Moore, the U.S. Air Force's decision authority for the F-15SA program.